It’s vital that water management policies be properly integrated into Iraq’s post-conflict recovery. With the liberation of Mosul from so-called Islamic State (IS) in November 2017 Iraq entered – once again – a post-conflict period. In the process of rebuilding the country, shrinking water quantities and acutely declining water quality have reached unseen levels and pose tremendous challenges: dam building in Turkey and Iran has contributed to a remarkably reduced water inflow of the Euphrates and Tigris; Iraqi water installations had been in very poor condition before IS used water as a weapon and further damaged infrastructure; Kurdish de facto control over the Tigris River’s waterflow upstream of Baghdad requires careful coordination between the Kurdistan Regional Government (KRG) and central government; extremely salinised water resources and environmental degradation in the Marshes risk the extinction of agricultural activities and livelihoods in that area. To address these challenges, technical measures will be important, and necessary – for instance, investment in water infrastructure. But that will not be nearly enough, as the water issue has the potential to accelerate re-emerging social divisions and political fragmentation and thus undermine Iraq’s stability and security. 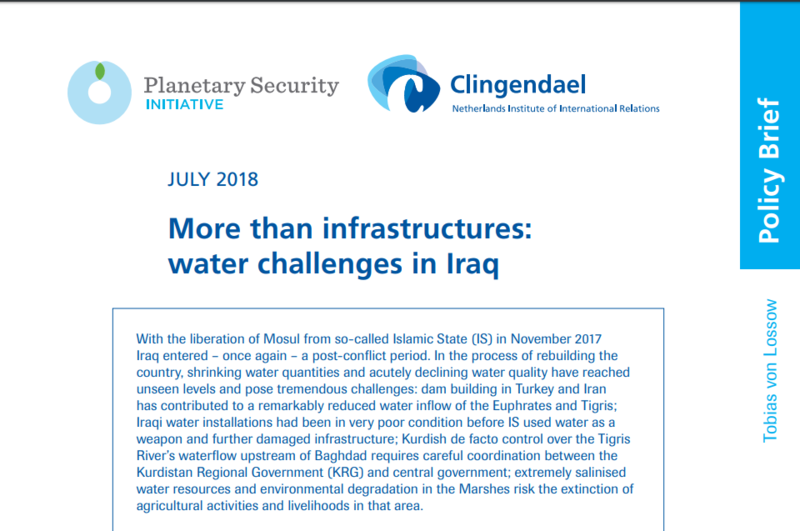 The political implications of water policies must be carefully taken into account in Iraq’s postconflict process and should complement technical efforts in this crucial sector. The basin-wide protection of the supply infrastructure could serve as a technical as well as political entry point for water cooperation in the region.